The supplement industry tends to have a negative reputation because most supplements fall short of what they are marketed to do. However, there are certain basic supplements that are just as good as they sound. 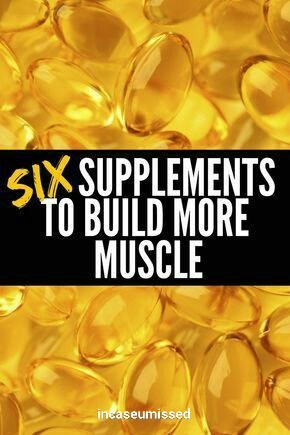 In this article we will discuss six of the most effective fitness supplements and how they have the potential to help you reach your goals. Most people usually fall into 1 of 3 camps when it comes to supplements. One group despises any type of supplement and believes they are all just useless marketing schemes.The second group loves supplements and relies on them far too much.The last group respects the need for supplements as a way to fill gaps in nutrition and take your body to the next level, but doesn’t rely on them too much. Think of supplements as furniture, and proper diet and exercise as a house. You need to have an actual house built first before being concerned with the furniture inside. If you have your house built, the next logical step is to get furniture to enhance the benefits of having a home. Similarly, it would be wise to look into the following supplements if you have already mastered your nutrition and training. Whey protein is a widely accepted supplement by most athletes and an ideal way to help you consume your daily protein goals. It should be noted that whole food sources should always be your first option before choosing to have a protein shake, but there are many times when whole food is just not an option. Some examples of when protein powder can come in handy is when you’re traveling, when your day is very hectic, when you run out of prepared meals, and during a workout. There are three main types of protein powders as well: concentrates, isolates, and hydrolysates. This type of protein is created by extracting protein from whole food sources through the use of heat and acid or enzymes. This type of powder can range from 35% to 80% in actual protein content, with the remaining percentage made up of carbohydrates and fats. Obviously, the higher the actual amount of protein that is in your protein concentrate, the better. Protein Isolate is a protein powder that is further filtered which removes the fat and carbohydrates from it. Therefore, it is a finer blend usually made up of 90-95% protein. While this is the standard to measure protein isolates, unfortunately not every company makes a high-quality version. We will talk more about this later on in this article. This type of protein is further filtered to break down the bonds of amino acids inside the protein. By breaking up the amino acids within the powder it allows your body to digest them even faster and enables your muscles to absorb them the quickest. Overall, whey protein is a great tool to use when you are unable to have a whole food meal or need a fast-digesting alternative. I currently use Level-1 whey protein as a meal replacement and Phormula-1 during and/or after my workouts. Both are micro-filtrated so there are never any chunks (which is one of my biggest gripes with most proteins I’ve had in the past), they taste amazing, and I never feel bloated or get an upset stomach from them. Taking creatine monohydrate can help increase your power output in the gym. It is one of the most widely researched supplements on the market, and is one of the least expensive ones as well. Interestingly, not everyone reacts to creatine monohydrate, especially if they are already getting a lot through whole foods. Creatine monohydrate causes you to hold onto more water, so drinking enough water on a regular basis is critical. Some people opt not to use this while cutting because of the extra water weight, but it can be very useful for any muscle growth phases you go through. Inside your muscle cells there are molecules called ATP that are broken down for energy. When you workout, ATP is broken down faster than it can be created which limits your ability to continuously perform at higher intensities. Phosphocreatine is also found in your muscles which helps create more ATP. When you supplement with creatine monohydrate, it increases the amount of Phosocreatine in your muscles so that you can create more ATP, and therefore have more energy during workouts. According to this study, supplementing with creatine monohydrate can result in a 5-15% increase in both power and work volume achieved. That extra work allows you to breakdown more muscle fibers in the gym so they can be rebuilt bigger and stronger during recovery. Some people prefer to load this supplement for the first 5-7 days. That means they take higher than usual doses at first to get more of it in their body faster. After the 5-7 days they decrease the dosage. Research has shown that loading is not required. It may help you see faster results, but starting with the recommended smaller dose is fine as well. If you are loading, it’s recommended that you take 0.3 g/kg of bodyweight for the first 5-7 days and then decrease to 0.03g/kg bodyweight per day. Some experts believe supplementing withcreatine monohydrate can help improve body composition and strength when taken pre-workout, but the margin of the improvement tends to be very small. For most people, creatine monohydrate can be taken at any time of day and still be effective. Fish Oil is a great source of Omega-3 fatty acids, which can help balance out the high level of Omega-6 fatty acids that the average diet usually consists of. Ideally you want a 1:1 ratio of Omega 3 and 6 fatty acids. Maintaining that ratio is associated with healthier blood vessels, a lower lipid count, and reduced risk of plaque buildup. Fish oil has also been known to help fight against cancer, heart disease, ADHD, joint pain, arthritis and many more. Plus, it has the ability to speed up recovery time, burn body fat, support testosterone levels, and promote muscle growth. The more time you spend in the gym, the more likely you are to eventually experience joint pain. Supplementing with fish oil is a great way to help keep your joints healthy so that you can continue to push through intense workouts. This supplement can also help reduce blood pressure. If you are a bodybuilder, you may be more likely to have higher blood pressure due to the nature of the sport and the potentially high consumption of red meat. Fish oil can help lower it and works to avoid high blood pressure related illnesses like heart disease. The main benefits of multivitamins take place when your body has nutrient deficiencies. Ensuring you consume adequate amounts of vitamins, minerals, and antioxidants (micronutrients) will help with your overall well-being and ability to fight diseases. At one point in time, people could get most if not all of their micronutrients from food alone. Unfortunately, newer evidence suggests that it is much harder to accomplish that today. For instance, one study by Misner analyzed 20 (14 athletes and 6 sedentary) people and every single one came up deficient in the recommended daily micronutrient intake. Obviously that is a rather small sample size, but the more active you are, the more likely this is to be an issue. The need for multivitamins to supplement your diet becomes especially important if you are in a calorie deficit. That is because you are eating below maintenance and the chances of you not meeting your daily micronutrient goal is very high. I do recommend prioritizing whole food sources first when it comes to getting the nutrients your body needs, but I still take a multivitamin supplement to fill in the gaps each day and make sure I keep my body performing at the highest level. Glutamine is the most abundant amino acid found in your muscles. It can be greatly reduced during workouts, so supplementing with it can help your body recover faster. It has also been linked to protein synthesis, which is key for building additional muscle. Supplementing with Glutamine can help you minimize muscle breakdown which makes it especially useful if you are ever dieting and trying to burn fat, but don’t want to lose muscle. Glutamine also helps boost your immune system. In fact, it’s your immune system’s primary energy source. For athletes at a higher risk of getting sick due to extreme diets, glutamine can be a great choice. Similar to multivitamins, if you are already a healthy person who follows a balanced diet and are not an extreme athlete, your need for additional Glutamine is probably going to be less critical. But if you are an active person it can be very beneficial. It can also be a great help if you are constantly under high stress situations. Glutamine’s ability to keep your immune system healthy is very helpful when dealing with high levels of stress. High stress can reek havoc on your body’s well-being as well as hinder it’s ability to build muscle and burn fat. It is recommended to take 2-5g of Glutamine twice daily and if you’re a bodybuilder you’ll want to bump that up to 10g . Amino acids are the building blocks of your muscles. The term “Branched Chain Amino Acids” refers to three amino acids: leucine, isoleucine, and valine. They can also be found in food such as meat and eggs. People on lower protein diets don’t usually consume enough of these amino acids naturally, so supplementing can be helpful. Supplementing with them can help promote muscle growth and prevent fatigue in athletes. They are most beneficial for people in a few different situations. The most common instances when you’d want to look into BCAAs are if you are dieting down to very low body fat levels, if you perform any type of fasted training, and if you leave large spaces in between meals or fast during any part of your day. In those cases, supplementing with BCAAs can be a great way to extend protein synthesis between meals and help promote muscle growth. Putting your body through intense workouts can often create the need for additional support to help your body fully recover. In those cases, the right supplements can definitely help you take your body to the next level. Plus, they can also help you improve your performance in the gym which has many benefits as well. The key is to remember that supplements are simply meant to supplement your already strong training and nutrition. As long as you use them appropriately, you will be on your way to building the body of your dreams.